Copy the contents of the SimSafari CD and paste them into the folder that was created before. When everything has finished copying, go to <Setup Folder>\SETUP and delete the ENSETUP.EXE file. Once the installer has finished, go to the installation folder and run the SMSAFARI.EXE file to play the game. Somewhere on the computer (ex. <Hard Drive Letter>\Games), create a new folder called "SMSAFARI". 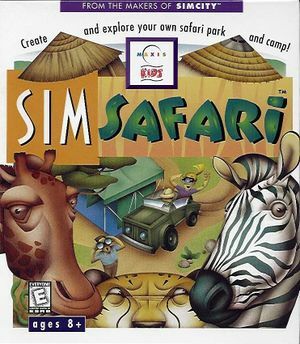 In the SimSafari CD, go to the SMSAFARI folder. When everything has finished copying, go into the installation folder and run the SMSAFARI.EXE file to play the game. Follow the steps from "Setting up the game (Simple)". Go into the "SMSAFARI" folder at your pasted location and edit the file "SMSAFARI.INI". Replace all the "C:" with the filepath of where "SMSAFARI" is located (ex: c:\smsafari\data → C:\Games\smsafari\data). This is important as it tells "SMSAFARI.EXE" where to search for the necessary files (NOTE: Do not use ".\" as the game will crash when one tries to save or load a savefile). If one wishes to change the folder name "SMSAFARI", ensure that change is reflected in "SMSAFARI.INI".